USA, June 1946. When an experienced squadron takes to the skies over the Miami coastline to identify flight objects that have passed through a no-fly zone, the last thing that they were expecting to encounter was a secret Nazi invasion force. The war may be over in Europe, but, as this scenario plays out, we learn that the Nazis were actually preparing to lay siege to America. Aces of the Luftwaffe: Squadron premise certainly isn’t as outlandish as Iron Sky, a wacky movie where, after the Nazi forces were defeated in World War II, those that remained fled to the Moon where they built a space fleet in secrecy to conquer Earth. 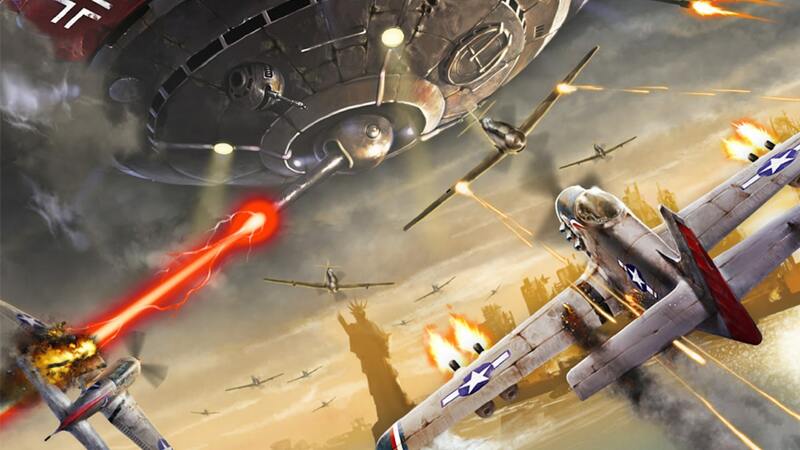 On Nintendo Switch though, you will be gunning down Nazi warplanes and, once you have made visual contact with them, the Aces of the Luftwaffe, which are intimidating war machines – the first of which is a UFO that is manned by a crazy professor. It’s your responsibility to take them down and, in the process, retaliate against and defeat the unexpected invaders. This vertically scrolling shoot ’em up places a squadron comprised of four planes that are piloted by Mark Taylor, Melissa Monroe, John King, and Steve Davis under your direct control. Those that want to play solo will control one pilot with the others flying in formation around them, but one of the game’s strengths is that as many as four players can hop in a cockpit. The difficulty in Aces of the Luftwaffe: Squadron will increase in reaction to more players defending the skies, but that comes at the chance to receive extra medals and rack up higher scores. It won’t come as a surprise that the general gameplay is your typical bullet hell, with the player left to haphazardly weave their way through the ammunition that has been unloaded in their direction. But developer HandyGames know that Aces of the Luftwaffe: Squadron needs something extra to stand out, and that comes in side missions. Whether surviving until the end of a level, destroying marked targets, hovering over locations to drop supply crates, or chase sequences where the player is challenged not to take too many hits, these present a constant change in pace from level to level. Your pilots are a sickly bunch, too. Each will be taken out of action temporarily every now and then, whether that be Mark’s chronic sickness that will require players to slow their plane’s movement to give him time to recover, Melissa’s acrophobia that will see her take a break whenever you chance altitude, Steve’s narcolepsy that can see him fall asleep in the cockpit and require the other planes to defend him until he wakes up, or the maddening rage that overwhelms John whenever he sees a Nazi. These are an annoyance when playing alone, but throw in a few friends and working to help each other out proved to be a better experience. There’s a chance that the enemies that you shoot out the sky will drop a crate tied to a parachute, which are weapon upgrades that, once retrieved, will steadily increase the potency of your firepower for that level’s duration. Their spiralling remains will also drop medals, which are used to level up your squadron. This earns you skill coins that can be used to let each pilot learn new skills, whether that be increasing the damage they deal, unlocking special abilities such as summoning meteors, or improving their movement speed. There are also more aircraft to retrieve from random loot drops in specific levels, and in-game achievements for those that want something else to aim for. With a fully voiced narrative, whether that be in cutscenes or mid-flight when you’re gunning down your enemies, the presentation in Aces of the Luftwaffe: Squadron also packs enough personality to differentiate it from other games in the genre on the Nintendo eShop. Bullets puncture the screen as you take damage, and the painterly cartoon art direction was a smart choice. The voice actors have a German twang which seems at odds with them flying in the United States Army Air Forces, but that’s only a minor grumble in the grand scheme of things.